Spending far too much time looking at cute animals on the internet is surely one of life's guiltiest pleasures. After all, there's nothing quite like seeing a piglet in pigtails or a raccoon hitching a ride in a hoodie to ease the tedium of your daily commute. But how much effort actually goes into the creation -- and maintenance -- of these pet accounts? Is it really a matter of simply snapping a pic of your cute kitten before moving on with your day, or are we talking hours upon hours of carefully staged photo shoots here? 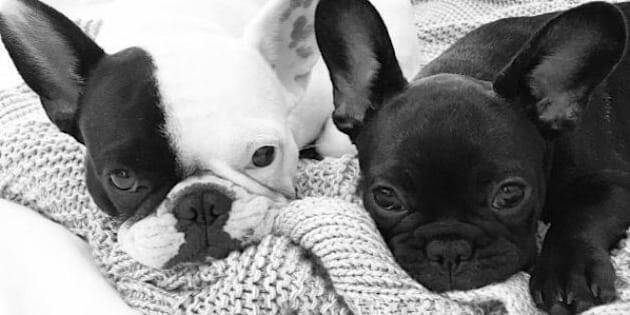 Lisa Chu is a Sydney-sider who runs the popular Instagram account miss_olive_the_frenchie, dedicated to her two French bulldogs, Olive and Mabel. The account has only been up and running for around 18 months, yet has already amassed a faithful fan base of around 59,300 followers -- one of them the international fashion illustrator Megan Hess. While Chu's little Frenchies could be considered 'small-time celebrities' in terms of the pet Instagram world (Pumpkin the raccoon from the Bahamas has more than 751,000 followers, for instance, while Grumpy Cat has 1.4 million), it's still more followers than most humans would ever dream of. "I really just wanted to do a little diary of Olive’s life," Chu told The Huffington Post Australia. "As well as really loving photography and interior design, and having worked in fashion most of my life, all it was at the beginning was some photos of Olive. It started off as fun and just escalated from there. "Basically I started the account the minute I first saw her, when she was five weeks old or so, before we even picked her up to take home. I didn’t want to bore my friends with countless photos -- because, you know, you get so obsessed when you get your first puppy -- and I wanted a place to put those puppy pictures without feeling like I was bombarding people with them." From those early days, the interest in Olive (and, later, Mabel) spiralled, until presents were arriving for both pooches from all over the world. "They have lots of little presents sent to them. In fact, Olive acts as a brand rep for some dog clothing companies and pet treat companies," Chu said. "I check them out first, obviously, to make sure they're not dodgy, and I do try to promote Australian companies as much as I can. Bonefide Collections, for example, do beautiful little hoodies and jumpers and scarves, and they are all Australian made. Pet Parcels is another one. They do all organic, free range dog treats." In terms of just how time-consuming running a pet's Instagram account is, Chu says olive_the_frenchie is very much a casual hobby and one she doesn't take too seriously. "Like I said, it just started out as something to do for fun. Olive is so easy to take photos of -- she has such a calm personality -- and I first started doing little things like putting fashion item in the shot with her, like a Chanel bag, for instance," Chu said. "In the beginning, I would use treats to make her sit and position her somehow, and then for her to stay until I took a few photos. Sometimes it takes 15 photos to get the perfect one, but I just snap them on my iPhone and use an app to brighten them up a little bit later. "I'm not grooming them in a particular way. They appear just the way they are. Olive in particular has such a calm personality she is very happy to be dressed up or for me to put sunnies on her and take a picture. Mabel isn't quite at that stage yet." Which brings Chu to her next point. Though a certain amount of training went into teaching Olive how to pose for the camera, she is adamant that would not have been the case if she felt her pup was actively disliking the process. "Olive has always been quite happy to, say, put a hoodie on, but I think their personalities are so much more interesting than whatever they are wearing in the picture," Chu said. "If a dog does not want to put an outfit or a scarf on, don’t force them, ever. "Olive could quite happily sit there and pose whereas Mabel isn't as into it. She is still a little apprentice, so she's still got time to learn, but I tend to take more personality-based shots with her anyway. "Like Mabel right now, it's the perfect photo. She is chewing a leg off the chair and her quirky little face is saying 'I know I shouldn’t be doing this'... it's really very cute." Though Chu tries to post a new photo once every one or two days, she says the most time-consuming part of running the account is actually responding to fans. "I do try to answer as many comments as I can, and that can be a bit time consuming, but at the same time I really appreciate all our followers and want to take the time to interact with them," Chu said. "All up, I give myself an hour a day on Instagram [to spend on the account]. I think people can get a bit too obsessed with it. Really, it's just a fun hobby. "The Instagram dog community in general is just so positive. It's like a little escape from reality. There is so much crap going on in the world, so many atrocities, it's nice to escape sometimes. It's like our little happy place."